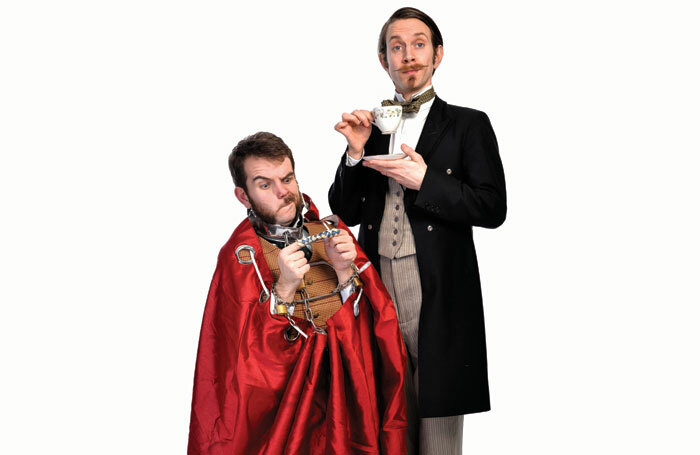 Smoothly moving on from their time-travelling schtick, the enthusiastic Rhys Morgan and curmudgeonly Robert West build on their stage personas in this thoroughly entertaining hour, which delivers its magic without boasting too much about its own prowess. The gentle incorporation of magic tricks into a narrative that plays on their characters is what makes the whole production work as well as it does. It allows an audience of over-fives to laugh roundly at the foolishness of Mr West as he tries to produce an egg from an empty bag – a real egg, not the fake eggs of various colours that both Mr Morgan and a helper from the audience produce as if they were going out of fashion. The duo’s time-travelling and Victorian backstories provide concrete patter from which the magic emerges – and it’s invested in the characters on stage. Both performers have the wit and skill to dive just that little bit deeper than caricature, while maintaining the necessary polish to keep the comedy alive. The tricks themselves – sawing in half, prediction, liquid from nowhere and plenty more – is well known. It is the delivery that is special in this winning production, perfectly crafted under director Peter Clifford for its target audience.